57 Marlborough is located on the north side of Marlborough, between Berkeley and Clarendon, with 53 Marlborough to the east and 59 Marlborough to the west. 57 Marlborough was designed by Sturgis and Brigham, architects, and built in 1867 to be the home of the firm’s partner, John Hubbard Sturgis, and his wife, Frances Anne (Codman) Sturgis. The land for 57 Marlborough was purchased from the Commonwealth of Massachusetts on August 1, 1863, by a trust established for Frances Sturgis’s benefit in the will of her father, Charles Russell Codman. On September 10, 1866, the trustees transferred the property to John Sturgis. Click here for an index to the deeds for 57 Marlborough. John and Frances Sturgis were living in England and, before 57 Marlborough was completed, they decided to remain there (they did not return until September of 1870). On October 1, 1867, the unfinished house was purchased from John Sturgis by his double brother-in-law, attorney Charles Russell Codman. He and his wife, Lucy Lyman Paine (Sturgis) Codman, made it their home. They previously had lived at 7 Park Square. Charles Codman was Frances Codman’s brother and his wife, Lucy, was John Sturgis’s sister. As part of the sale, the house was modified to raise the roof, enabling three additional rooms in the attic story, and the finish of some of the rooms was changed to match the Codmans’ furniture. The Codmans also maintained a home in Cotuit. In 1877 and 1878, the Codmans were living elsewhere. During the 1876-1877 winter season, 57 Marlborough was the home of H. W. Rogers. By mid-1877, it was the home of attorney and mining investor Horatio Ripley Bigelow and his wife Anne Lenthal (Smith) Bigelow. Their unmarried son, Joseph Smith Bigelow, also a mining investor, lived with them. They had lived at 76 Marlborough in 1876. They also maintained a home in Hanover. Joseph Bigelow married in April of 1877 to Mary Cleveland Bryant and they moved to Cohasset. 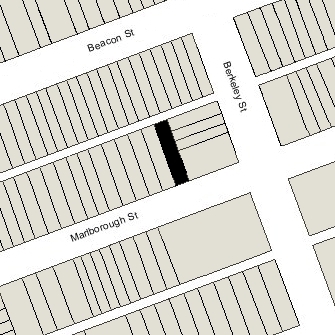 By 1878, Horatio and Anne Bigelow had moved to 254 Beacon. During the 1877-1878 winter season, 57 Marlborough was the home of J. W. Paige. The Codmans had resumed living at 57 Marlborough by the 1878-1879 winter season, but were once again living elsewhere in the mid-1880s. 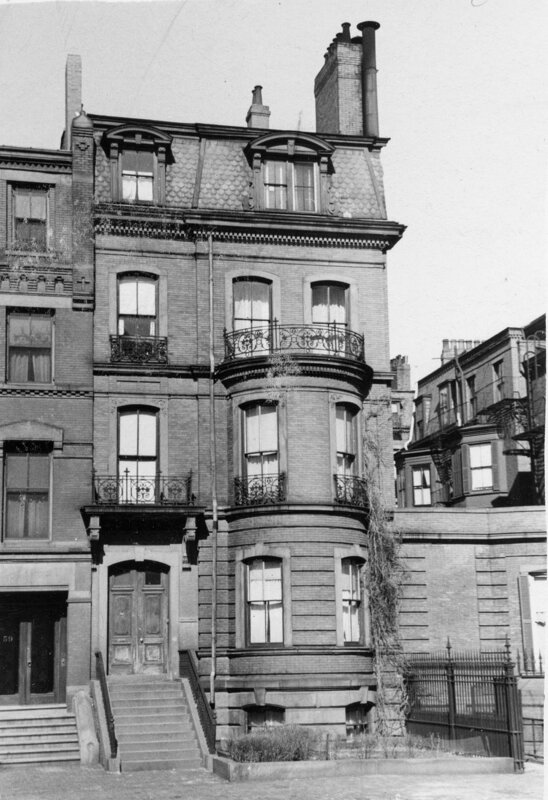 During the 1884-1885 winter season, 57 Marlborough was the home of W. A. Burnham, probably architect William Appleton Burnham and his wife, Alice (Monroe) Burnham, whose permanent Boston residence in the mid-1880s was at 87 Beacon. During the 1885-1886 winter season, 57 Marlborough was the home of attorney William Sohier Dexter, a widower. He previously had lived at 24 Mt. Vernon. By the next season, he had moved to the new new home he had built at 18 Exeter. By the 1886-1887 winter season, the Codmans were living at 57 Marlborough once again. In about 1904, they were joined there by Charles Codman’s half-brother, Richard Codman, a widower. He was an interior decorator and previously lived on Cottage Avenue in West Roxbury. Charles and Lucy Codman and Richard Codman continued to live at 57 Marlborough during the 1904-1905 winter season, but moved soon thereafter. They were living in Brookline at the time of Lucy Codman’s death in January of 1907. Charles Codman continued to own 57 Marlborough and lease it to others. By the 1905-1906 winter season, 57 Marlborough was the home of attorney Arthur Lyman and his wife Susan Channing (Cabot) Lyman. They previously had lived in Brookline. They also maintained a home in Waltham, where he had served as Mayor. Charles Codman died in October of 1918, and on June 21, 1919, Arthur Lyman purchased 57 Marlborough from his surviving children: Russell Strugis Codman; Anne Macmaster Sturgis (Codman) Cabot, the wife of Henry Bromfield Cabot; Susan Welles (Codman) Fiske, the wife of Redington Fiske; John Sturgis Codman; and Julian Codman. The Lymans continued to live at 57 Marlborough during the 1928-1929 winter season, after which they made their Waltham home their year-round residence. The house was not listed in the 1930-1934 Blue Books and Lists of Residents, and was shown as vacant in the 1930-1934 City Directories. Arthur Lyman died in April of 1933. On November 29, 1933, 57 Marlborough was purchased from Arthur Lyman’s estate by Dr. Charles Alonzo Draper, a chiropodist. He and his wife, Gladys Lucie (Garrett) Draper, made it their home. They previously had lived (and he had maintained his office) in Dorchester. Their son, Charles Elliot Draper, a real estate dealer, lived with them. In October of 1933, prior to taking title to the property, Dr. Draper filed for (and subsequently received) permission to convert the house from a residence to a doctor’s office and residence. In March of 1934, he filed for (and received) permission to convert the house into a three-family dwelling. In December of 1935, Dr. Draper acquired 197 Beacon, which he converted into apartments. On January 13, 1936, he transferred 57 Marlborough into his wife’s name. In October of 1941, Charles Elliot Draper acquired 199 Beacon, which he converted into a lodging house. 57 Marlborough remained the Drapers’ residence and his medical office in 1945. By the mid-1940s, they had remodeled the house into ten apartments and a doctor’s office. In February of 1945, they were cited for failing to obtain Building Department approval of the change in occupancy. On May 31, 1945, 57 Marlborough was acquired from Gladys Draper by William J. Dooley. Charles and Glydys Draper and Charles Elliot Draper moved to 199 Beacon. 57 Marlborough subsequently changed hands and on August 14, 1945, was acquired by real estate dealer Ray C. Johnson, who transferred it on the same day to Edna M. Hudson and Herbert C. Sharpe. In April of 1946, Ray Johnson filed for (and subsequently received) permission to legalize the occupancy as nine apartments and two lodging units. The property changed hands again, and on October 31, 1946, was acquired by Tanya Natalie (Polsky) Richmond Saletsky Pearlman, the wife of Nathan Pearlman, a furniture dealer. They lived in Dorchester and later in Brookline. By 1950, the Pearlmans had installed new kitchens and bathrooms and the occupancy was established as eleven apartments (the distinction between apartments and lodging units being eliminated). Natalie Pearlman died in August of 1960. Nathan Pearlman continued to own 57 Marlborough. During the Pearlmans ownership, it suffered fire damage at least twice, once in 1959 (when there was damage to the fourth and fifth floors, in the front), and again in 1970 (when there was minor damage to the fourth floor). On December 28, 1973, 57 Marlborough was purchased from Nathan Pearlman by Hugh Scott Mellor and Ralph David Fraser, trustees of the Marlborough 57 Trust. 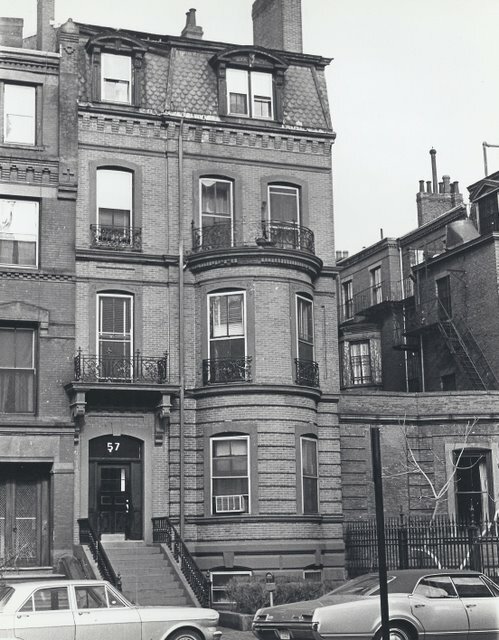 On August 1, 1979, 57 Marlborough was purchased from Hugh Scott Mellor and Ralph David Fraser by Stephen V. Miller, trustee of the 57 Marlborough Street Trust. On December 11, 1979, the trust transferred the property to the 57 Marlborough Realty Corporation (Paul G. Roiff, president and treasurer). 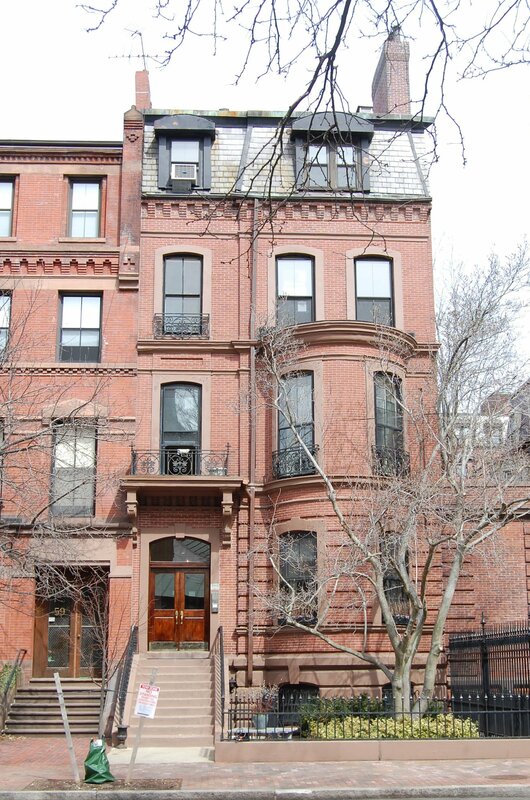 That same day, it converted the property into eleven condominium units, the 57 Marlborough Street Condominium. In January of 1980, the 57 Marlborough Realty Corporation applied for (and subsequently received) permission to remodel the house into six, floor-through units, and on July 4, 1980, it amended the condominium master deed to reduce the number of condominiums to six.